Fabricators of themed environments all over the world use Smooth-On theming rubbers, plastics and foams to bring fantasy and excitement to new heights for thrill seeking patrons. What themed environments feature elements and displays were made With Smooth-On theming materials? Las Vegas Hotels & Casinos, Place du Casino in Monaco, The Venetian Macao Casino and many more from around the world. Theme parks like Disney: Orlando, Disney: Anaheim, Disney: Paris, Disney: Tokyo, Universal Studios, Six Flags Amusement Parks, Great Adventure Amusement Parks. Theme Restaurants including Manhattan’s ‘Jekyll & Hyde’ and Kansas City’s Beachbums Island. Talk to our technicians about your project. We’ll share our experience in helping other theme fabricators and give you material options. Liquid rubbers, plastics, foams, etc. for making award-winning taxidermy mounts & displays. Taxidermists around the world know Smooth-On mould making rubbers, casting plastics, foams, etc. to be versatile, consistent, and economical. Yes You Can! Smooth-On has dozens of materials and supplies to choose from and technical support to put you back on track if you get into trouble or lose your way. These materials are very easy to use and offer almost limitless design possibility. ‘I use to pay someone else to make my antler molds, but I now do it myself using Mold Max Stroke silicone and Smooth-Cast 320 plastic. And once I got good at that, it led to other projects using foams, pigments and plastics I didn’t even know existed’. Taxidermists like Tony Breedlove of Wildlife Art Creations in Melrose, FL, use Smooth-On rubbers, plastics, foams, pigments, etc. to create flawless reproductions of fish, reptiles, waterfowl and game. Innovative mould making and casting techniques have redefined the state-of-the-art in realistically reproducing wildlife. EZ~Spray® Silicone 20 spray rubber is made especially for dispensing through Smooth-On’s EZ~Spray® Jr spray gun and has been developed specifically for applications that utilise vacuum bagging processes such as resin infusion and prepreg. Sprayed silicone vacuum bags offer many advantages to traditional bagging materials and techniques. The advantage that EZ~Spray® Silicone 20 offers versus conventional vacuum bagging systems is the speed at which a production-ready silicone bags can be made resulting in significant time and labour savings. EZ~Brush® Vac Bag silicone is a brushable addition-cure silicone developed especially for making high performance, reusable silicone vacuum bags. EZ~Brush® Vac Bag silicone is easy to mix and apply. Mix ratio is 1A:1B by volume and rubber can be applied with a brush or spatula to vertical surfaces without sagging. Silicone vacuum bags are durable & can be reused time and again. 90% reduced labour costs. Green process: no bag film waste, reduces environmental impact. Smooth-On’s versatile line of sprayable rubbers, plastics, and foams are for large projects or for completing a number of smaller projects simultaneously. The EZ~Spray, Jr spray system is an inexpensive alternative to buying complicated spray equipment that can cost £30,000 and more. The EZ~Spray, Jr spray gun is portable, easy to use and can deliver all of Smooth-On’s sprayable materials. Recommended: The EZ~Spray system is for very specific projects, and we recommend that you discuss your project with Smooth-On technical support before investing in this technology. Bentley’s rubbers, plastics, foams, and other materials have been used for years to bring film, television, and stage special effects to life. …and many more productions too numerous to list! Smooth-On mould rubber has been used for more than 60 years to reproduce sculpture all over the world ranging in size from less than 2.5cm to almost 120 m high. Today, Smooth-On urethane, silicone, and polysulfide rubbers are used by thousands of sculptors and foundries for casting wax, resins, plaster, concrete, and other sculpture materials to make accurate reproductions of original sculpture. Project Specific: Smooth-On’s wide range includes mould rubbers that can be poured on, brushed on, sprayed on, or pressed on to any original sculpture and will reproduce detail perfectly. Reproductions can be cast in urethane plastic, epoxy resin, plaster, concrete, and more. Click here to contact our technical department to discuss your sculpting project and material options. The mouldmaking and casting materials which Bentley carries can be used to create prototypes which accurately reflect every detail of your original. Whether your original model is a clay sculpture, carved tooling board, or a 3D print, we can help you produce a useable and testable prototype. Bentley’s carries silicone rubbers which cure with virtually no shrinkage, as well as casting resins and rubbers which can reproduce the performance characteristics of many production materials. Make your idea a reality…contact Bentley Advanced Materials for guidance. Bentley’s rubbers, plastics, foams, epoxies and other materials have exceptional physical and mechanical properties that make them suitable for a variety of industrial and military applications. Bentley Advanced Materials carries urethanes and silicone rubbers available in hardnesses ranging from softer than skin to harder than a car tyre and everything in between. From the general purpose ‘Smooth-Cast’ resin line to the specialty ‘TASK’ performance urethane plastic line and castable epoxies. Easy to use, premium formulations with premium physical and performance properties compared to commercially available “packing” foams. Bentley supplies many major automobile manufacturers, all branches of the Military, and thousands of industrial customers. These are not adhesives that you can find at the DIY centre, and they offer exceptional bonding properties for a variety of industrial applications. Click here to contact our technical support line to discuss your project. We’ll help you select the material that’s right for you. Looking for a new hobby? Bentley rubbers, plastics and foams are ideal for a variety of home hobbies and arts & crafts projects. The easy to use OOMOO or Mold Star silicone mould rubbers are perfect for the hobbyist and can be used to reproduce detail of any small or simple model. Smooth-Cast 300 liquid plastic can then be poured into your OOMOO or Mold Star mould to make an exact copy of your original. Great for school projects (note: these materials require adult supervision at all times). What Kind of Hobby & Craft Projects? Smooth-On plastics are used to create eye-catching resin jewelry – Many UK jewelry makers have found the ease of use of urethane resins and silicone rubbers to be a great match for their hobby. Some have even created their own businesses! Lifecasting materials help create long lasting memories – Making a lasting keepsake of your child’s hand or face is safe and easy with Alja-Safe alginate. The Alja-Safe Starter Kit has everything you need to be successful. 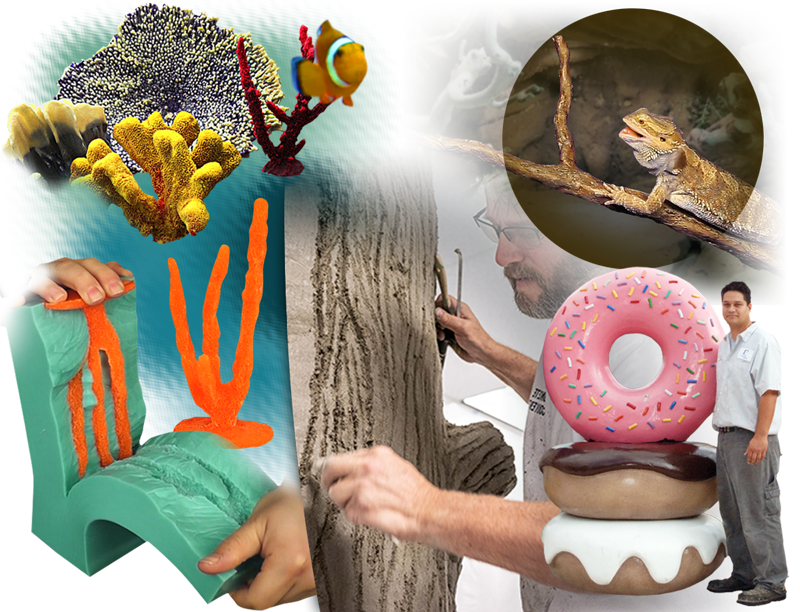 Our tutorials will show you step-by-step how to make sea anemones, coral, sea fans, sea sponge, rock scapes and more. These materials allow you to make custom shapes, sizes and coloured display pieces that are hyper-realistic. There are no limits to what you can create! Why Smooth-On for Custom Aquarium Decorations?